Posted on 26, February 2016 by EuropaWire PR Editors | This entry was posted in Education, European Union, Germany, Science and tagged Dr. Sylvia Erhardt, ERC, European Research Council, Heidelberg University. Bookmark the permalink. Heidelberg, Germany, 26-Feb-2016 — /EuropaWire/ — Heidelberg biologist Dr. Sylvia Erhardt is receiving a highly endowed grant from the European Research Council (ERC), an ERC Consolidator Grant for excellent young researchers. In the five-year project, entitled “The role of RNA in centromere biology and genome integrity”, Dr. Erhardt will explore centromeres – structures which are essential for cell division. ERC funding in the amount of 1.9 million euros is being provided. Dr. Erhardt leads a junior research group at the Center for Molecular Biology of Heidelberg University (ZMBH) as part of the university’s CellNetworks Cluster of Excellence. The project is scheduled to start in April 2016. Dr. Erhardt’s research focuses on how chromosomes are correctly split during cell division so that the genomic integrity of the daughter cells is retained. A seemingly small but complex chromosomal constriction, the centromere plays an important role in this process and forms the structural and functional basis for chromosome division. According to Dr. Erhardt, it is critical that each chromosome has only one centromere in order to prevent instability in the genome. Surprisingly, this is not regulated by the DNA sequence but by epigenetic mechanisms that have a connection with RNA. The researcher intends to use the ERC grant to systematically identify the ribonucleic acids located on centromeres and decode their function in centromere biology. 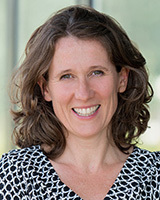 Dr. Erhardt and her team hope to gain new insights into how chromosome division in the cell proceeds smoothly and to fill in the remaining gaps in the understanding of epigenetic regulation of centromeres. Sylvia Erhardt (b. 1971) received her degree in biology from Heidelberg University in 1998 and earned her doctorate in 2003 from the University of Cambridge (Great Britain) with a dissertation in the biological sciences. Her postdoctoral research took her to the University of California in Berkeley in the USA. From the beginning of her scientific career, her research focused on epigenetics, a field that studies heritable mechanisms of gene regulation not directly encoded by the DNA. She returned to Ruperto Carola in 2008 to continue her research with her own ZMBH junior research group under the auspices of the CellNetworks Cluster of Excellence. Last year Dr. Erhardt received the Hella Bühler Prize. The prize endowed with 100,000 euros is aimed at young researchers at Heidelberg University whose outstanding cancer research has garnered well-deserved attention. The ERC Consolidator Grant is given to promising researchers whose own independent working groups are in the consolidation phase. Scientific excellence is the main criterion.